Over the past few years, I have noticed a trend of parents applauding other parents who have humiliated their own children, on video, in order to get their kids to change behavior. Supportive observers seem to regard this as "taking control." I regard it as an ego-centric attempt to cover up the fact that those parents failed to be in control in the first place. There's the video of the cowboy-hatted philosopher who repeatedly shoots his daughter's laptop with a 9mm handgun after he reads a letter to the world about how bad of a kid she is. I think that one started it all. (I won't link to such psychological child abuse.) There's the dad who moved his daughter's room into the driveway because she doesn't clean up. Since then, I have seen numerous videos meant to humiliate kids into behaving better. They tend to "go viral." And people tend to support it. Many praise these parents for "being tough" with their kids. I find that disturbing beyond description. Sickening. I find "being tough" with one's kids to be essential. I think my own children would attest to the fact that dad is no pushover when it comes to action and consequence...which is probably why I don't wind up desperate enough to go to social media for my parental mojo. I actually work, incrementally and consistently, on instructing my kids in proper behavior and by imposing consequence when they don't do what I ask. Sadly, sometimes they are not pleased with me when this happens, but...they get over it. Why doesn't a girl clean her room? Because she has been allowed not to. It is the fault of the parents. You need to set the groundwork when she is three, not lash out at her when she is sixteen. You can throw anything you want at me in defense of these humiliation tactics: "What if a parent punishes and punishes and the kid does not respond? Sometimes you need to try something drastic..." It won't work. Unless one's child has certain mental illnesses (and I say this with absolutely no sarcasm or implied humor), that child will respond to the use of the proper "currencies." Room not clean? No going out this weekend. Clean the room and you can go out. Simple. The concept is simple, if not the practice, but that is where we parents need to stop worrying about being the bad guy. Sometimes we need to be the bad guys and that, admittedly, takes guts. And if the child is mentally ill, humiliating him or her is probably not the best psychological approach, so we can rule that out, too. Every single thing my kids do that I do not approve of can be traced to one source: I never gave them a good enough reason to change; I didn't hold firmly enough. My responsibility. I have to either accept that I didn't teach them properly or take another approach, with them, in private. This is not about making myself feel like a man and emptying fifteen rounds into my daughter's possessions for the applause of my fellow parental units. This is yet another symptom of a world in which every instinct toward privacy is being crushed. We are pathetic and desperate as parents if we think we need to resort to public shame to handle our own children. Why don't we go back to scarlet letters? 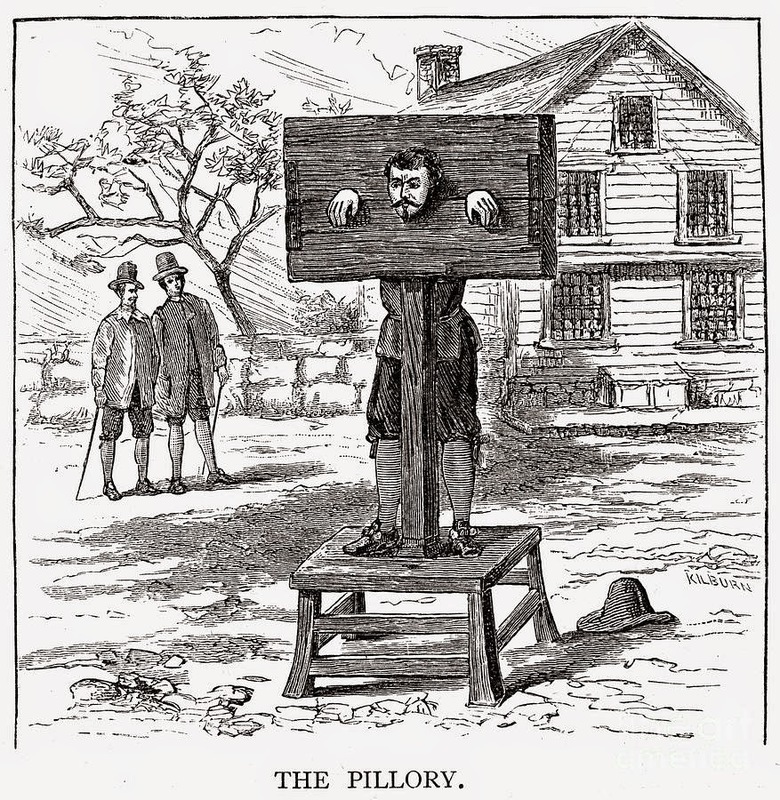 The pillory? That would work just as well. My kids? As far as you know, they are perfect. You will never hear me speak an ill word of them on H&R or on Facebook or Twitter. I respect their dignity. They are human beings, so they deserve dignity, intrinsically. But they are also the two finest little men I have ever known. I would not forfeit my right to their respect by treating them like naughty pop stars in a tabloid -- by making them a public joke. My family? We're a team. We don't go behind each other's backs. We have to establish that pattern if we want our kids to buy into it when they get older. If we don't have that instinct as families, we are truly lost. The idea of not being afraid of revealing the private lives of the family/child is actually symptomatic, non-rhetorically, of being parentally narcissistic. I don't know whether or not you knew that, but you were spot on. Sadly such behaviour is common nowadays to the point that it may become socially normative. I currently live with the parents of a beautiful young girl, and while she's in the teenage rebellion stage of wanting to do bad things just because they're bad (she even admits to this), they share your parenting philosophy and have had no major issues with her. Might is not right. I agree. Aggression and humiliation rarely achieve anything. I find that humour usually works on my younger son, who giggles guilty and gets the message. If he doesn't, then a little sterness goes a long way. His ASD older brother is far more challenging and less compliant, but love and kindness always get better results than anger and punishment. Steerforth -- I think you summed-up the perfect formula: love, kindness and sterness, when necessary. The only thing I know is that betrayal is just never a good idea. It may work in the temporary, but when one is talking about lifelong relationships, it's like introducing a cancer. Mr. Matarazzo: I believe that much 'modern' teenage behavior is a copying or vicarious living out of attitudes, language and behavior observed on television and in the movies. I have seen bad behavior in today's young people and some of it feels staged to me. Congratulations on another fine post. Thank you, sir. I couldn't agree more about the influence of TV and movies. It can't be underestimated in terms of impact. As a teacher of teenagers, I have found that some gentle, satirical comedy from me can make them aware of their "acting" and it generally minimizes it. Kids are still good people -- sometimes someone just need to help them realize it.